Here at Your Marquee we are proud to provide the two most well-suited marquee styles to the outdoor wedding market. They give ergonomic design while maintaining the fashionable trends of the ever-changing market place. Frame marquees will always be appealing, due to their flexibility and simple design. They can be built almost anywhere and with the right know-how can be compartmentalised to create unique individual spaces for your event. The Pole marquee is fast becoming an equally popular structure due to the recent boom in ‘rustic weddings’. 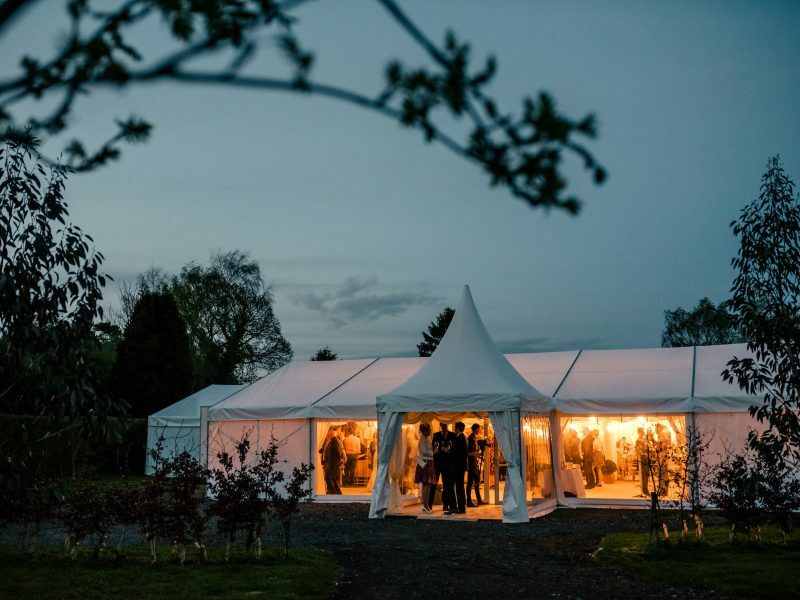 The Pole marquee’s extra design features (wooden poles, large clear windows and no linings) really promote the ‘look’ many brides and grooms are looking for at the moment. While the pole marquee is a little less forgiving when it comes to placement compared to the frame marquee it does hold a larger presence with its high peaked roofs, curved sloping canvas giving a light and spacious atmosphere. The rigid structure means placement of the Pole marquee has certain criteria that must be met. For example, the footprint of the Pole marquee exceeds the actual floorspace due to the guy ropes needed to support the structure. This creates a 2-metre space between the edge of the marquee and overall space required to position the Pole Marquee meaning to stand a 12m wide marquee you actually need a 16m wide space. These are all matters that our experienced project managers will happily chat through with you at a site visit. They are all reasons though why a narrow-walled garden for example might be better suited to a frame marquee. Whereas a large open space such as a paddock might go better with a tall and large pole marquee. In contrast to this the frame marquee is the king of flexibility. Modular increments of 3 metres means we can construct a frame marquee in the smallest of spaces, though it is equally at home hosting upwards of 200 people. Arguably a warmer cosier feel once dressed it could be that a frame marquee holds an advantage through the colder months of the year. A frame marquee is also slightly lower in roof height and of course with heat rising that means that a frame marquee is more snug in winter. Coupled to that, you also have factors like luxury loo’s being able to be in separate but linked marquees to the main one and this is another reason why framed marquees are arguably more suited to winter events. Certain styles and themes are potentially better suited to one or the other, however we’ve gained a lot of experience in creating hybrids of the two structures. Essentially a frame marquee with the benefits of the pole marquee, such as peaked roofs and rustic timber styling cues. Due to our continued investment we can create beautiful spaces throughout our range allowing us to develop solutions to many of our client’s objectives. Whether customers’ requirements are shaped by design, logistics, or price. We’re always up for the challenge of ticking every box. Get in touch to arrange a site visit with us and we’ll guide you along the way.